This page Speculum Sophicum Rhodostauroticum is part of the mysticism series. Speculum Sophicum Rhodostauroticum is a book written by Daniel Mögling under the pseudonym of Teophilus Schweighardt Constantiens. In the Speculum, Mögling repeatedly refers to Thomas a Kempis's Imitatio Christi as a major source for Rosicrucian thought. Mögling allegedly did not believe in the actual existence of the Rosicrucian Brotherhood, but adhered to its theosophical and pansophist principles. 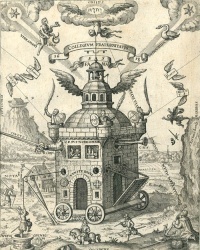 The four engravings in the Speculum offer an ‘orbis pictus’ of the Rosicrucian movement and were to provide lasting inspiration for later Rosicrucian iconography. Unless indicated otherwise, the text in this article is either based on Wikipedia article "Speculum Sophicum Rhodostauroticum" or another language Wikipedia page thereof used under the terms of the GNU Free Documentation License; or on original research by Jahsonic and friends. See Art and Popular Culture's copyright notice. This page was last modified 22:40, 6 July 2013.